Bellingham is one of those places you can enjoy visiting for a weekend or for a month. Whether you're into the arts, shopping, good food, and wine, or wildlife watching, Bellingham visitors find plenty of diversions. Bellingham and Whatcom County are particularly rich in opportunities to enjoy the outdoors, whether on a river, a lake, a forest, or on a mountain. And don't forget scenic Bellingham Bay, where you can take in a whale watching cruise or enjoy a kayak tour. Spread among three different buildings, the Whatcom Museum offers quality exhibitions of regional art, history, and culture. The newest addition, the Lightcatcher Building, features space for both national and regional exhibitions and is a Smithsonian affiliate. The Family Interactive Gallery inside the Lightcatcher offers kid-friendly interactive experiences. The Spark Museum of Electrical Invention is home to an extensive collection that includes early radios, vacuum tubes, telephones, telegraphs, static electricity machines, and scientific apparatus. The collection of experimental setups from the early days of scientific exploration of electricity is particularly fascinating. Special exhibits include an accurate replica of the Titanic radio room, a 1930s living room where you can sit back and experience old-time radio entertainment, and an 18th-century laboratory that interprets basics of electricity. Highly recommended. Tennant Lake is shallow and surrounded by wetlands and fields, making it a great place for viewing birds and wildlife. The Tennant Lake Interpretive Center houses exhibits on the local flora and fauna. The adjacent Fragrance Garden is truly a feast for the senses, where visitors are encouraged to smell and touch the plants. A boardwalk (open seasonally) winds through the swampy terrain, providing up-close views of critters that fly, walk, and swim. Located a short drive from Tennant Lake, Hovander Homestead Park is quite family friendly. Expansive lawns, picnic tables, and play equipment provide a perfect setting for a day outdoors with your loved ones. The park is home to the historic Hovander House, including a picturesque red barn surrounded by antique farm equipment. Kids of all ages will enjoy checking out the farm animals, including sheep, rabbits, turkeys, and peacocks. Lynden is a charming rural town that is proud of its Dutch heritage. The downtown area is filled with antique and gift shops, as well as bakeries and dining spots. Both Dutch Mother's restaurant and Lynden's Cup of Tea tea room are worth a visit. The ​Lynden Pioneer Museum has an excellent collection that includes dozens of horse-drawn vehicles. Lynden is located in the northwest part of Whatcom County. Located just north of Bellingham in the town of Ferndale, the Silver Reef Casino offers Vegas-style gaming, fine and casual dining, live entertainment, spa services, and lodging. This lovely rainforest park has trails that wind through a scenic gorge filled with waterfalls, green moss, and ferns. Along the way, you'll find several benches where you can rest and enjoy the view. The park also has picnic areas and tennis courts. Recreation trails can be found in parks and neighborhoods throughout the city of Bellingham. Popular trails include the South Bay Trail, Sehome Arboretum, and Cornwall Park. Rental bikes are available at Fairhaven Bike & Ski, which is located next to the South Bay Trail. Enjoy a walk through the WWU campus as you take in their outdoor sculpture collection that features international, national and regional artists. Some of the best whale watching excursions in Washington depart out of Bellingham and Whatcom County docks. While keeping an eye out for orcas, you'll see an abundance of other wildlife as well as the charming San Juan Islands. Many of these operators offer flexible itineraries that can include such add-ons as kayaking or gourmet meals. Whatcom County is particularly rich in scenic hiking trails. Some follow rivers, others take you to mountain tops. Some are flat and easy, others are steep and challenging. Here are some hikes that shouldn't be missed. Located by Birch Bay, this short hike starts out with an easy trail through a lovely forest that occasionally opens up to water and island views. It ends with a steeper stretch down to a rocky beach. This 4-mile hike in Larrabee State Park allows you to take in some stunning views of the San Juan Islands. This fairly easy hike, accessed off the Mt. Baker Highway just inside the Mt. Baker-Snoqualmie National Forest, takes you along the blue rushing waters of the Nooksack River. This short interpretive trail at Heather Meadows in Mt. Baker-Snoqualmie National Forest offers surrounding views of Table Mountain, alpine lakes, and wildflower meadows. Just down the road from the visitor lodge at Heather Meadows, this easy hike around tiny Picture Lake includes the much-photographed view of Mt. Shuksan. Located at the end of the Mt. Baker Highway and only accessible 2-3 months of the year, this scenic hike and viewpoint offer breathtaking views of Mt. Baker and Mt. Shuksan that will stick with you for a lifetime. Other popular outdoor activities in Bellingham and Whatcom County include kayaking, boating, fishing, bicycling, bird watching, and skiing. If you want to enjoy the outdoors from the comfort of your vehicle, there are some amazingly scenic drives out of Bellingham. Just under 60 miles long, this scenic drive follows Highway 542 from Bellingham to Artist Point in Mt. Baker-Snoqualmie National Forest. As you head east from Bellingham you’ll pass by farms and vineyards. Attractions along the way include the small Nooksack River Casino, the Kendall Creek Hatchery, and Black Mountain Forestry Center. You’ll enter the National Forest near the town of Glacier; the route becomes more steep and windy as you approach the Mt. Baker Ski Area and head on to Artist Point. You can stop and enjoy scenery and hiking at Horseshoe Bend, Nooksack Falls, Heather Meadows, and Artist Point. The views of Mt. Baker, Mt. Shuksan, and Picture Lake are all incredible. There isn’t much in the way of food or services along the Mt. Baker Highway. If you don’t pack your own picnic, then Grahams Restaurant in Glacier is a good place to stop for tasty food and microbrews in a laid-back setting. Every season brings something new to celebrate in Bellingham and Whatcom County. Here is a sample of the fairs and festivals you can choose from. This family-friendly event celebrates Fairhaven’s founder, Dirty Dan Harris, with music, games, and wonderful seafood. Lynden celebrates its Dutch heritage with traditional song, dance, music, food, a Fun Run, Tulip Pedal bicycle rides, and a flower market. This festival is centered around an 85-mile relay race that has legs including cross-country skiing, downhill skiing/snowboarding, running, biking, canoe, mountain biking, and sea kayaking. Other festivities include a parade, block party, and beer gardens. Held on the Ski to Sea Sunday, this community street fair has all the traditional favorites, including live entertainment, food and craft booths, and a beer garden. This two-week series of classical concerts features world-class musicians from our nation’s finest orchestras, brought together to form the Bellingham Festival Orchestra. Enjoy all the traditional country fair entertainments and activities, including FFA animal exhibits, big-name concerts, yummy fair food, and commercial booths. Artists and craftsman of all kinds open their studios to the public during two weekends each October. Jody Bergsma's dreamy watercolor paintings feature real and imaginary creatures and natural settings. The gallery showroom offers a wide selection of matted or framed prints, art cards, crystals, and gift items. All the clothes, gear, and gadgets you need for your outdoor adventures, ​including camping, hiking, climbing, and snow sports. Demo and rental items are also available. Mark Bergsma's art photography features natural Northwest themes, including trees and water views. In addition to his own works, his gallery has an excellent selection of works from other artists and craftspeople, including glass art, jewelry, and paintings. Located just south of downtown Bellingham, the charming Fairhaven neighborhood has a great selection of unique shops and art galleries. Highly recommended. Open from April through December, this open-air market features fresh locally-grown produce as well as crafts, flowers, and other foodstuffs. Whatcom County produces wonderful berries, nuts, apples, seafood, and more. All of this bounty can be enjoyed in Bellingham’s many quality eateries. Boundary Bay’s menu is filled with unique dishes made from Northwest ingredients. They also offer house-made microbrews and standard pub food. Highly recommended. Find more great restaurants in Bellingham. Hotel Bellwether is the perfect place to enjoy a few days' escape from the stresses of everyday life. Filled with elegant furnishings and amenities, the guest rooms make you feel pampered and comfortable. 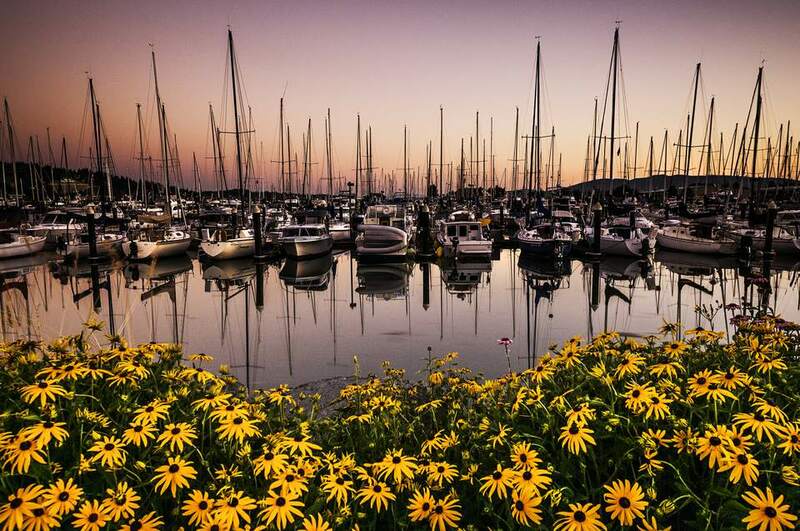 The beautiful setting, surrounded by the scenic waters of Bellingham Bay, allows for an easy adjustment to a slower pace of life, if only for a long weekend. This elegant boutique hotel provides convenient access to Fairhaven's shops, restaurants, and waterfront trails. Room amenities include down bedding, bathrobes, fine toiletries, and high-speed Internet access. Guests can also enjoy continental breakfast in the morning room, complimentary tea and coffee in the library, and a large balcony off the second floor. Bellingham is located 89 miles north of Seattle on Interstate 5. Bellingham International Airport is served by several major airlines, including Allegiant and Horizon. The airport also provides general aviation services. The Amtrak Cascades, which runs between Eugene, Portland, Seattle, and Vancouver, BC, stops at Fairhaven Station, just south of downtown Bellingham. The Greyhound bus stops at Fairhaven Station several times each day. The Bellingham Cruise Terminal is the southernmost terminus of the Alaska Marine Highway System. The Washington State Ferry System does not provide regularly scheduled service to Bellingham.